“Job advertising is a numbers game, but it also requires a keen eye for the story behind the data." 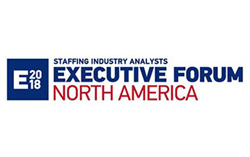 Recruitics CEO Josh Gampel, along with Dennis Tupper, Recruitment Marketing Strategist at Kelly Services, a leading global workforce solutions company, will be featured “Ideas in Action” co-presenters at the Staffing Industry Analysts (SIA) Executive Forum North America in Miami later this month. This session, titled “Recruitment Marketing Analytics: The Key to Increasing Gross Margin,” will be open to attendees on Tuesday, February 27 at 4:45pm. In this presentation, Gampel and Tupper will explain how using the proper recruitment marketing analytics can help staffing companies be successful in recruitment marketing and increase gross margin. Gampel will demonstrate how visualizing and isolating the most important data leads to easier and smarter decision making, while Tupper will show how Kelly Services has been able to improve and optimize their advertising strategies by gaining access to the proper analytics and then using those analytics to build rules for their strategy. Attendees of their presentation can enter to win six months of FREE recruitment marketing agency services from Recruitics, valued at more than $15,000. Recruitics is the leading recruitment marketing agency that makes it easy for companies to understand and optimize their job advertising strategies by leveraging real-time data and programmatic technology. As innovators in the space, Recruitics developed the recruitment industry’s first-to-market programmatic job advertising platform, Recruitics Action, as well as the industry’s premier FREE recruitment marketing analytics dashboard, Recruitics Analytics. You can find Recruitics at SIA Executive Forum North America at a Staffing Services Showcase Kiosk in the main exhibition hall during the conference. Interested parties can meet the team, sign up for free Recruitics Analytics, and learn more about how Recruitics can help your company improve your recruitment marketing strategies and increase gross margin. Executive Forum North America (http://www.cvent.com/events/2018-executive-forum-north-america/event-summary-b0d70389f57f49f1946deb35d82d4763.aspx) is the pre-eminent annual meeting for CEOs, owners and senior-level executives from staffing firms across industry sectors. The 27th annual event features inspiring keynote speakers, breakout sessions on a wide range of topics and many opportunities to network with peers and sponsors. SIA’s “Ideas in Action” sessions showcase leading suppliers and their solutions to the industry’s most pressing challenges. As a global leader in providing workforce solutions, Kelly Services, Inc. (Nasdaq: KELYA, KELYB) and its subsidiaries, offer a comprehensive array of outsourcing and consulting services as well as world-class staffing on a temporary, temporary-to-hire, and direct-hire basis. Kelly® directly employs nearly 500,000 people around the world in addition to having a role in connecting thousands more with work through its global network of talent suppliers and partners. Revenue in 2017 was $5.4 billion. Visit kellyservices.com (https://www.kellyservices.com/) and connect with us on Facebook (https://www.facebook.com/kellyservices), LinkedIn (https://www.linkedin.com/company/kellyservices/), & Twitter (https://twitter.com/kellyservices). Recruitics is the leading recruitment marketing analytics and advertising platform that makes it easy for companies to understand and optimize their job advertising strategies by leveraging real-time data and programmatic technology. Founded in 2012, Recruitics works with the nation’s largest employers, staffing agencies, and job boards to drive more applicants to their online job postings, hire great talent, and achieve their recruitment goals. Recruitics also partners with a number of other global ATS systems and other HR technologies to provide seamless integration and tracking. The company is headquartered in New York City, NY and is privately owned and operated. You can find Recruitics online (https://www.recruitics.com) or follow @Recruitics (https://twitter.com/recruitics) on Twitter.